Timeline: What has Trump said about North Korea over the years? 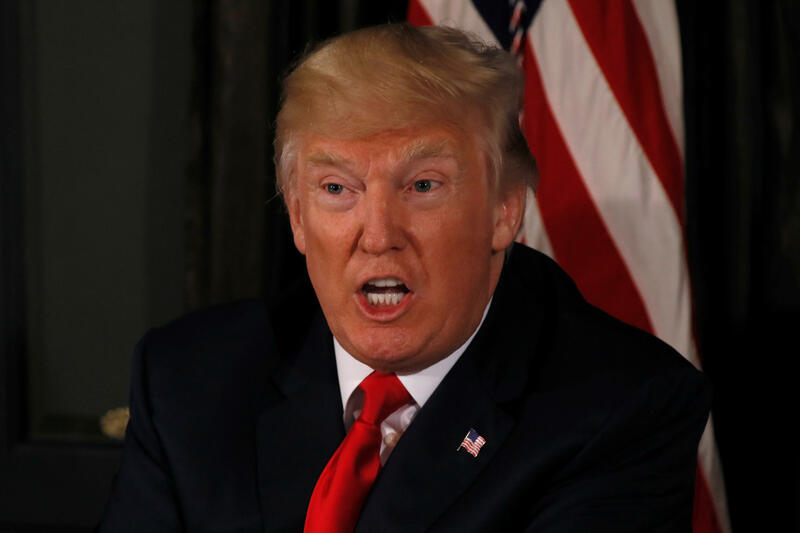 President Trump's "fire and fury" warning to North Korea on Tuesday prompted more measured statements of reassurance from other administration officials both nations ratcheted up current tensions over the nuclear threat. Late last week, he welcomed the U.N. resolution's expanded sanctions against the regime. In recent months, the president has turned to China for help in containing North Korea. In April, he issued a number of tweets on the subject. One expressed confidence that "China will properly deal with North Korea." He suggested that he might not deem China a currency manipulator because it was working with the U.S. on North Korea. He pointed out that China is "very much the economic lifeline to North Korea," and "if they want to solve the North Korea problem, they will." By May and June, when the North was launching test missiles, the president pointed out the "disrespect" it was showing China, and he acknowledged the death of Otto Warmbier, a college student who had been imprisoned by the regime and then released to the U.S. while he was comatose. On June 20, he tweeted that "While I greatly appreciate the efforts of President Xi & china to help with North Korea, it has not worked out. At least I know China tried!" By the end of July, though, Mr. Trump was growing impatient with China: "...they do NOTHING for us with North Korea, just talk. We will no longer allow this to continue. China could easily solve this problem," he tweeted. Over the years, the president's statements about North Korea have differed. In fact, nearly 20 years ago, Mr. Trump said that he would "negotiate like crazy" with the country. During the 2016 presidential campaign, he conveyed mixed messages about his approach to North Korea. Oct. 24, 1999: "Meet the Press" host Tim Russert asked Mr. Trump in an interview if he would be willing to launch a preemptive strike on North Korea's nuclear capabilities as president. "First, I'd negotiate. I would negotiate like crazy and I'd make sure that we try to get the best deal possible…These people in three or four years they're going to be having nuclear weapons. They're going to have those weapons pointed all over the world and specifically at the United States and wouldn't you be better off solving...the biggest problem this world has is nuclear proliferation and we have a country like there, North Korea, which is sort of wacko, not a bunch of dummies and they are going out and they are developing nuclear weapons...and wouldn't it be good to go out and really negotiate something?" Jan. 8, 2000: Mr. Trump made a stop in Minnesota for his presidential exploratory campaign and shared his views on many issues, including North Korea, according to a New York Times story from that day. He described North Korea as the U.S.'s greatest foreign threat, the report said, that is "run by some very bad people." March 9, 2013: "How much is South Korea paying the U.S. for protection against North Korea???? NOTHING!" Mr. Trump tweeted. April 6, 2013: "Our President must be very careful with the 28 year old wack job in North Korea. At some point we may have to get very tough-blatant threats," Mr. Trump tweeted. May 7, 2014: "Crazy Dennis Rodman is saying I wanted to go to North Korea with him. Never discussed, no interest, last place on Earth I want to go to," Mr. Trump tweeted. "Dennis Rodman was either drunk or on drugs (delusional) when he said I wanted to go to North Korea with him. Glad I fired him on Apprentice!" he also tweeted. Sept. 16, 2015: "Nobody ever mentions North Korea where you have this maniac sitting there and he actually has nuclear weapons and somebody better start thinking about North Korea and perhaps a couple of other places. But certainly North Korea," Mr. Trump said during the second 2016 GOP presidential debate in Simi Valley, California. Jan. 15, 2016: "China, they don't like to tell us but they have total control -- just about, of North Korea," Mr. Trump said during the sixth GOP presidential debate in North Charleston, South Carolina. "They can solve the problem of North Korea if they wanted to but they taunt us." Feb. 10, 2016: Mr. Trump said during an interview on "CBS This Morning" that he would get China to make Kim Jong Un "disappear in one form or another very quickly." Asked if that meant assassinating him, Mr. Trump said, "Well, you know, I've heard of worse things, frankly. I mean this guy's a bad dude -- and don't underestimate him ... Any young guy that can take over from his father with all those generals and everybody else that probably wants the position, this is not somebody to be underestimated." March 26, 2016: In an interview with The New York Times, Mr. Trump was asked if he'd be willing to withdraw U.S. forces from places like Japan and South Korea if they don't contribute enough toward the cost of keeping tens of thousands of American troops in their countries. Mr. Trump said, "Yes, I would. I would not do so happily, but I would be willing to do it." April 27, 2016: "President Obama watches helplessly as North Korea increases its aggression and expands further and further with its nuclear reach," Mr. Trump said during his foreign policy speech in Washington, D.C. "Our president has allowed China to continue its economic assault on American jobs and wealth, refusing to enforce trade deals and apply leverage on China necessary to rein in North Korea. We have the leverage. We have the power over China, economic power, and people don't understand it." May 18, 2016: In an interview with Reuters, Mr. Trump said he was open to speaking to North Korean leader Kim Jong Un. "I would speak to him, I would have no problem speaking to him," he said. He also said during the interview that he'd pressure China. "I would put a lot of pressure on China because economically we have tremendous power over China...China can solve that problem with one meeting or one phone call." June 15, 2016: Mr. Trump said in a speech in Atlanta that he would "accept" a visit by the North Korean dictator as part of "opening a dialogue." He said, "If he came here, I'd accept him, but we wouldn't have a state dinner like we do for China and all these other people who rip us off." April 30, 2017: CBS News "Face the Nation" host asked the president what he makes of the North Korean leader. Mr. Trump said, "People are saying, "Is he sane?" I have no idea. I can tell you this, and a lot of people don't like when I say it, but he was a young man of 26 or 27 when he took over from his father, when his father died. He's dealing with obviously very tough people, in particular the generals and others. And at a very young age, he was able to assume power. A lot of people, I'm sure, tried to take that power away, whether it was his uncle or anybody else. And he was able to do it. So obviously, he's a pretty smart cookie."